CDR FoodLab® is the analysis system for milk and dairy products to perform quality controls throughout the production process. One single instrument allows to determine a wide range of chemical parameters easily and rapidly. Analytical methods are optimized for making the system easy to use in laboratory as well at receiving inspection in dairy industry. The analyzer is equipped with a measuring system owes its sensitivity, accuracy and reliability to the photometric technology based on state of-the-art LED luminous sources. The results are correlated with the reference methods. With CDR FoodLab® you can determine a wide range of chemical parameters easily and rapidly without having to learn how to use different analysis systems. The system has been designed to determine the quality of low-fat milk or whole milk, raw or pasteurized, without any kind of previous sample treatment. CDR FoodLab® can also be used to test a wide range of cheeses and dairy products, like mozzarella, cottage cheese, yoghurt, butter, margarine with a minimal sample preparation developed by the CDR research laboratories that is far easier than official methods. CDR FoodLab for Milk and Dairy products was last modified: March 6th, 2019 by CDR s.r.l. What is the CDR FoodLab® System for assays on milk and dairy products? CDR Foodlab is a true testing laboratory. Thanks to its compact size, it can be ideally used in a laboratory, on the production line, or at the time of purchase. A self-contained apparatus complete with everything needed to perform quality controls of milk and dairy products. An analyzer based on photometric technology, available in the standard or Junior version, equipped with state of-the-art LED emitters, reading cells and 37°C thermostated incubation cells. Performing chemical analyses on milk and dairy products is simple and fast because sample preparation, if any, is minimal. All reagents are supplied pre-vialed and ready to use, and operators do not have to handle toxic or carcinogenic compounds; there is no need to wash either containers or traditional glassware. CDR FoodLab® guarantees reliable results for the tests performed on milk and dairy products. This measuring system owes its sensitivity, accuracy and reliability to the photometric technology based on LED luminous sources. Moreover, the correlation of the test results with the reference methods ensures the reliability of each and any analysis performed with the system. The CDR FoodLab® analysis system has been validated by the Standard Latte Laboratory as well as by other certified laboratories. 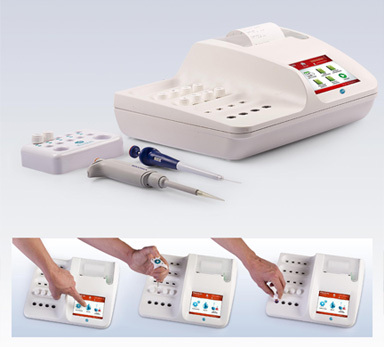 Comparative studies have given evidence that the accuracy of the results obtained with the CDR FoodLab® analytical method is in line with the accuracy of the results yielded by the reference methods, while CDR FoodLab® is much easier to use and provides the requested results in reduced testing time. 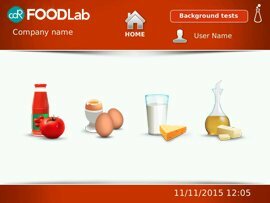 The CDR FoodLab® chemical analysis system to test milk and dairy products can be configured to perform analyses on egg products, tomato derivatives, any type of vegetable and animal fats and oils, and vegetable purées in general.